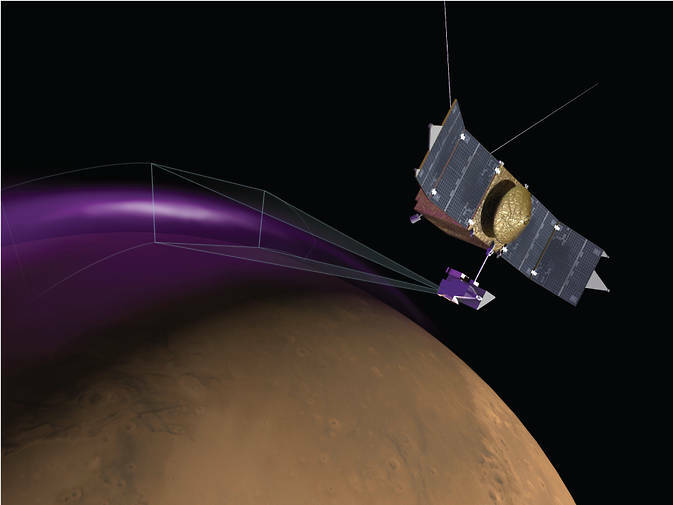 March 18, 2015 – NASA’s Mars Atmosphere and Volatile Evolution (MAVEN) spacecraft, built by Lockheed Martin, has observed two unexpected phenomena in the Martian atmosphere: an unexplained high-altitude dust cloud and aurora that reaches deep into the Martian atmosphere. 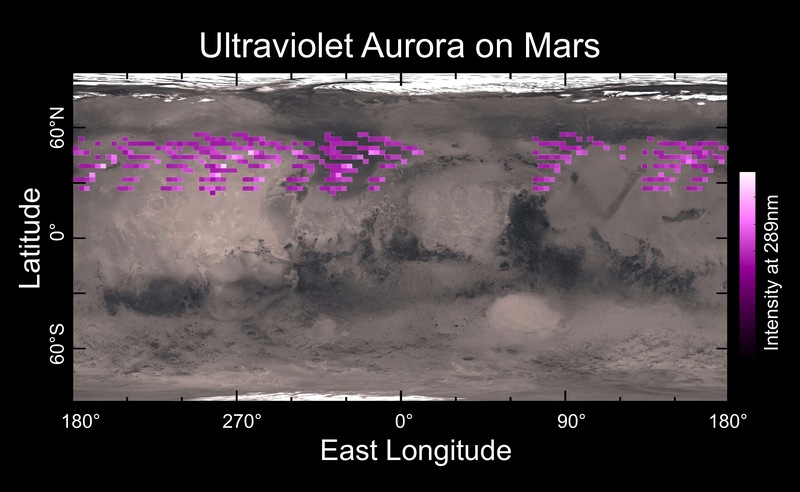 MAVEN’s Imaging Ultraviolet Spectrograph (IUVS) observed what scientists have named “Christmas lights.” For five days just before December 25, 2014 MAVEN saw a bright ultraviolet auroral glow spanning Mars’ northern hemisphere. Aurora, known on Earth as northern or southern lights, are caused by energetic particles like electrons crashing down into the atmosphere and causing the gas to glow. MAVEN launched November 18, 2013 on a United Launch Alliance Atlas V rocket from Cape Canaveral Air Force Station in Florida. The primary goal of NASA’s MAVEN mission is to reconstruct Mars’ climate history. MAVEN will provide information on how, and how fast, atmospheric gases are being lost to space today, and infer from those detailed studies what happened in the past. The spacecraft arrived at Mars on September 21, 2014 and is four months into its one-Earth-year primary mission. “The MAVEN science instruments all are performing nominally, and the data coming out of the mission are excellent,” said Bruce Jakosky of CU/LASP, Principal Investigator for the mission. MAVEN’s principal investigator is based at the University of Colorado’s Laboratory for Atmospheric and Space Physics. CU/LASP provided two of MAVEN’s science instruments and also spearheads education and public outreach for the MAVEN mission, which has contributed roughly $300 million to Colorado’s economy. Several CU-Boulder students work on the MAVEN science team, and there will be a number of additional CU-Boulder students working on MAVEN in the coming years. There are currently more than 100 students working on research projects at LASP, which provides hands-on training for future careers as engineers and scientists. The spacecraft’s flight operations are controlled by a team at Lockheed Martin’s Mission Support Area near Denver, Colorado. NASA’s Goddard Space Flight Center in Greenbelt, Maryland, manages the MAVEN project. Partner institutions include Lockheed Martin, the University of California at Berkeley, and NASA’s Jet Propulsion Laboratory.